THIS IS THE QUART SIZE - once we are out of this size container, only Litres will be available going forward. Keep in mind that the color may drift slightly from the quart to the litre, so if you are planning on doing more projects in the future to match...purchase the litre HERE!! California Prop 65 Warning - Visit HERE. Annie Sloan's Emile Gives a Beautiful Pop of Color! A warm soft aubergine color with pink red undertones giving a rich complexity that makes beautiful sophisticated lilac tones when Old White is added. It is a new color in the Chalk Paint palette adding a contemporary facet as the color is inspired by modern art. 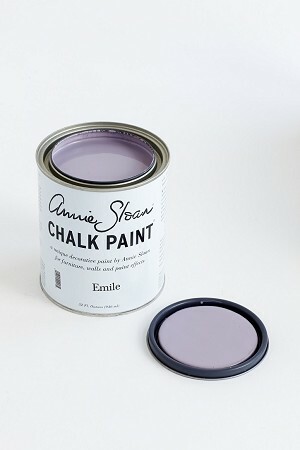 Don't forget when purchasing Chalk Paint® Decorative Paint by Annie Sloan- to consider purchasing her Clear Wax also. Annie's paint and wax were created to partner perfectly together! The paint itself will harden but the wax will truly protect it! The wax does completely harden and it becomes hard and is water repellent. It is a wonderful protective finish that you can buff once dry- to the sheen you desire. We are sorry – there are NO RETURNs when it comes to paint. You will find this for every stockist. Think about it- would you ever want a quart of paint sent to you - that was shipped to someone else prior? We eliminate any potential issues with this policy.